I’ve wanted to try fabric stamping since coming across Krista Fleckenstein's gorgeous fabric prints. She turns all sorts of materials into one-of-a-kind creations. 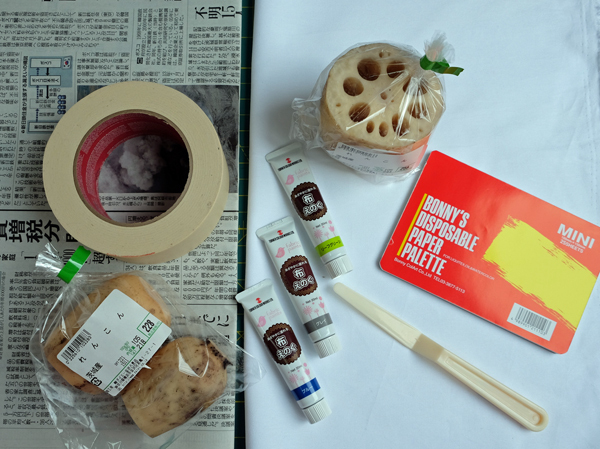 For my first attempt, I decided to use lotus roots as stamps rather than carving my own. I like the organic circles that change in size and shape depending on where you slice the vegetable. 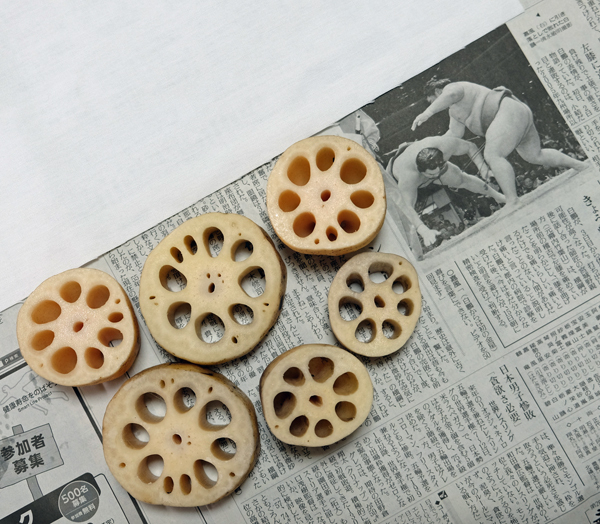 If you're not familiar with the lotus root, it's a common vegetable here in Japan, where it's called renkon. You can dice them up for curries and soups, and they'll stay nice and crunchy. They’re also pickled, fried, stuffed with sinus-clearing hot mustard, etc. I also gathered a fat quarter of white cotton fabric, some newsprint to protect the table, fabric paint, a spatula and disposable palettes. This is outside my comfort zone, and I might not have used all the right techniques/supplies. But I dove in and was excited to see what shapes would emerge. 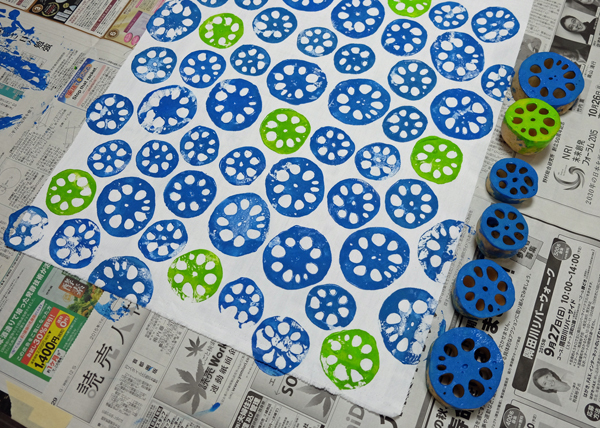 I didn’t stamp them perfectly, but I like how the overall pattern turned out ― almost like wonky viewfinders. To get the fabric ready to use, I air dried it for 24 hours, heat set it with an iron (using a pressing cloth) and then washed it to make sure the paint was secure. 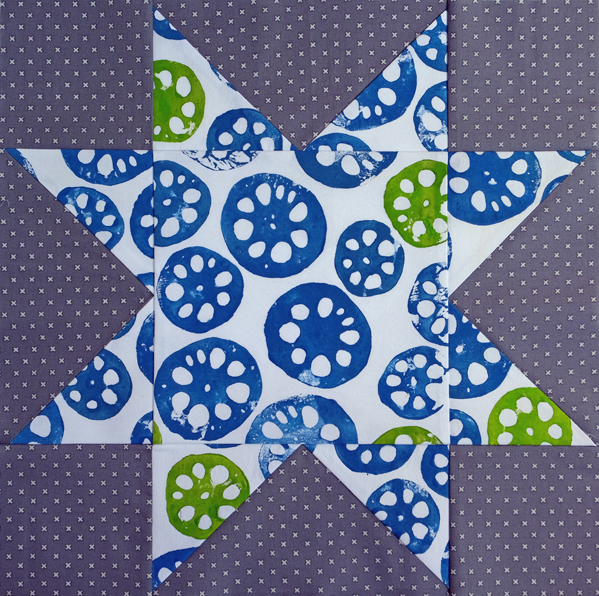 After the drying and setting process, I chopped up the fabric and made a sawtooth star quilt block. I paired it with a nice gray from Lecien's L’s Modern Basics. I used four flying geese units with Bloc Loc's 4” x 8” ruler, plus an 8.5” square for the center and four 4.5” corners. It’s 16" finished, so I’ll probably turn it into a mini quilt for my sewing room wall to remind me of a fun experiment. This is beautiful. I would love to try my hand at this--it would be a good project for my older grandchildren, I think. P.S. the picture of the sumo wrestlers in the newspaper made me chuckle. It would be great for kids. The only hard part is trying not to get paint everywhere! Very nice. The lotus root was an excellent choice. Now I want to go pilfer from my vegetable drawer. Celery maybe?